New Costco Coupons time for East Canada! These are valid in Ontario, Quebec and Atlantic Provinces. 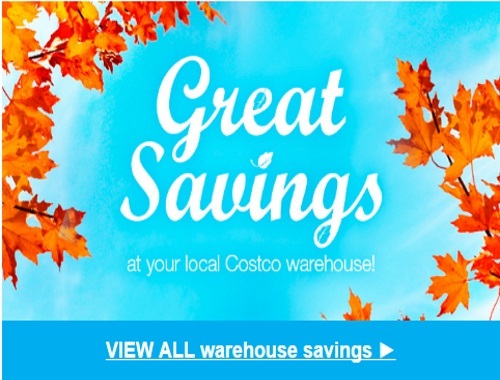 Please note, you do not have to print these coupons, they are available when you enter any Costco store in Canada, we just post them so that you can plan your shopping trips! $5 OFF Cashmere Premium 2-ply bathroom tissue. 32 x 293 sheets. 1245872. $5 OFF Ivory Snow Liquid laundry detergent. 96 washloads. 356315. $4 OFF Tide Advanced Power Liquid laundry detergent. 81 washloads. 456003. $4 OFF Gain Liquid laundry detergent. 146 washloads. 466263. $3 OFF Sun-Maid Raisins. 2 x 1 kg. 116719. $3 OFF Ravioli Gourmet Portobello mushroom ravioli. 850 g. 1077520. $2 OFF Russet House Organic sweet potato fries. 1.81 kg. 385845. $35 OFF the purchase of 4 boxes of Air Optix Aqua Sphere (6 pack), Air Optix Multifocal, Air Optix Astigmatism, Air Optix Night & Day, and Dailies AquaComfort Plus Sphere, Multifocal and Toric contact lenses (90 pack). Opti-Club optical centres in Costco’s Quebec locations are owned and operated by Joseph Martz, independent optician. $4 OFF Taste of Nature Organic bars. 18 x 40 g. 1071661, 358211. $3.50 OFF Barista Organic espresso coffee. 1 kg. 152341. $3.50 OFF Terra Delyssa Organic extra-virgin olive oil. 2 x 1 L. 362996. $2.50 OFF Becel Margarine. 2 x 1.22 kg. 1412017. $5 OFF 3M Scotch tape refill. pack of 8. 81843. Price before discount: $17.99. $3 OFF Garofalo Pasta variety pack. 6 x 500 g. 395186. $2.40 OFF Almond Preference Organic vanilla almond milk. 6 x 946 mL. 1030652. $2 OFF Kashi Organic autumn wheat cereal. 1.22 kg. 1075413. $2 OFF Grown Right Organic orange juice. 2 x 1.89 L. 974579. $2 OFF Mary’s Gone Crackers Organic crackers. 566 g. 205208. $2 OFF GoGo Quinoa Organic red and white quinoa macaroni pasta. 1 kg. 373578. Price before discount: $9.89.